Civic educator and public defender. Know anyone going to college or planning to go? Know a home owner or someone seeking to own or stay in their home? Know a small business owner who wants to expand but doesn't have the capital? How are they doing? My guess is, not so well. What do they all have in common? Lack of access to credit. Having easy access to cheap and plentiful credit is becoming a universal problem for families, students and small businesses all across Illinois and America. A public bank for Illinois would deliver that much needed cheap and easily accessible capital for credit-worthy borrowers that would make a world of difference for us and our neighbors. Think of a public bank operating for the public good and not private profit. Think of the public bank as an instrument to help circulate our own money in Illinois and not ship it off to Wall Street where huge profits are taken and few services are delivered to the people in return. We can make our money work for us, not against us. So how would a state bank work? For that, we have to turn to the only one in America, The Bank of North Dakota. The Bank of North Dakota was founded in 1919 to insure a dependable supply of affordable credit for farmers, ranchers and businesses. By the turn of the century, North Dakota's economy was controlled by a cartel of Minnesota grain brokers, bankers and railroads. The state's financial future was based on a single industry -- agriculture -- and a single crop -- wheat. Despite repeated efforts by some state leaders to break free, the banking cartel's control of shipping, marketing and financing kept the state in the unenviable position of being little more than a Minnesota colony. The bank was created as a result of intense organizing and the political campaign of the Nonpartisan League, established by A.C. Townley in 1915. A.C. was a former socialist and a failed farmer but he found his calling in organizing for this effort, going from town to town over the years and building the League to over 60,000 members. The plan for the bank was implemented after the League's candidates swept local and state elections in 1918. North Dakota is the only state sporting a major budget surplus; it has the lowest unemployment and default rates in the country; and it has the most community banks per capita of any state in the U.S. and because small businesses and farmers can get credit, jobs are created. 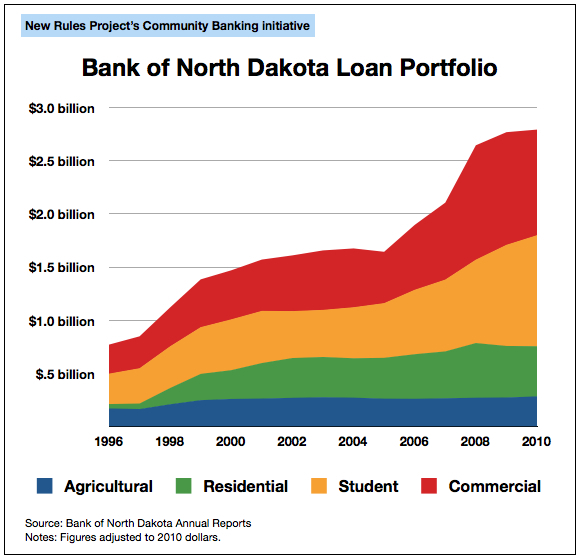 3) No local banks have failed in North Dakota. 4) The BND has returned in excess of $500 million to the State of North Dakota's general fund since 2000. 5) Since the year 2000 North Dakota's GDP has grown 56%, personal income has risen by 43% and wages by 34%. 6) In 2011 North Dakota is experiencing a $1 billion budget surplus! How does this affect the state? People keep more of their own money while pursuing their dreams. That money stays in the state and is re-circulated through their local economies. Bottom line: prosperity. According to the Bank of North Dakota's most recent annual report (2010), profits increased to $61.9 million during its seventh consecutive year of record profits. The bank is not a charity. It is a well run business that serves the public interest -- literally: in 2010 it returned a very healthy 19 percent ROE, which represents the state's return on its investment. North Dakota is the only state doing relatively well in the post-meltdown era. But that's the big picture. How about impacts for average folk? I know I would like to keep that $7,515 to improve my family's situation rather than send it to the Bank of America or Citibank. 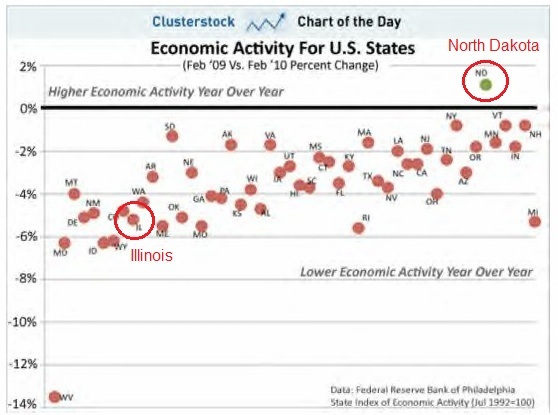 So, with the State of Illinois teetering on the brink of insolvency and Wall Street banks continuing to take profit here at our expense while wracking up criminal and SEC fraud charges, it seems like the right time to seriously look at a public bank for the Land of Lincoln. For more information on public banking, please visit the web sites for Illinois Citizens for Public Banking or The Public Banking Institute. Tom Tresser is a co-founder of Illinois Citizens for Public Banking.